So, we discussed this book for my RL bookclub in December. I hadn't quite gotten to the end, but have since finished it up. Interestingly, I was reading this book while listening to The Mayor of Castorbridge and periodically taking up The Awakening by Kate Chopin. Great Expectations was written in approximately 1860. The Mayor of Castorbridge was written about 1889 and The Awakening was 1899. Of the three, Dickens is the most lively writer, and truly one who seems the most contemporary. The book tells the story of young Phillip Pirrup, called Pip, starting at approximately age 7. He is cultivating his melancholy by reading the tombstones of his parents. He is met by a frightening specter of an escaped convict who frightens the boy into bringing food and a file to aid in his escape. The boy returns to his sister's house, where he lives, and manages to smuggle the goods to the convict. This experience has a profound impact on the boy, and he lives in fear that the convict will return and do him harm. Not long afterward, he is sent to the home of the local wealthy eccentric, Miss Havisham, to provide her with distraction and to entertain her. Miss Havisham was abandoned on her wedding day by her groom, and has refused to make any changes in her house since then. The clocks have all stopped, she has never changed out of her bridal gown, the wedding feast remains on the dining table, now given over to the rats and spiders. (The traditional English wedding cake is a fruit cake, which I guess is how it has lasted all these years). Miss Havisham has an adopted daughter named Estella, whom she has raised to be incapable of love, so that she may take revenge on all men for Miss Havisham's loss. At some point, Pip is contacted by a lawyer who tells him that he has an anonymous benefactor who wishes him to become a gentleman. Pip leaves his uncle (to whom he is apprenticed as a blacksmith) and heads to London to become a gentleman. The story shows Pip as an outsider to everyone in his life. Once he is taken up by Miss Havisham, he becomes acutely embarassed by the relative poverty he lives in. He strives to be an acceptable companion to Estella, but never feels he does. Meanwhile, his desires for gentility move him away from being comfortable in his life as a blacksmith's apprentice. He attempts to educate himself, which makes him embarassed at how little he knows, and how much more he knows than those around him. He becomes unsuited to be a blacksmith, so when the anonymous benefactor appears, he is glad to get away. In London, however, it becomes apparent how far he is from being a true gentleman. He takes up an apartment in a shabby hotel, in a seedy neighborhood. He studies with and corrupts the son of his new tutor, running them both into debt--Pip, at least, because he does not really know how to manage money, and he has no real occupation or calling. Always, there is the promise of great wealth to come to him, at some unknown time in the future. Pip is convinced that his benefactor is Miss Havisham, and that she intends for him to marry Estella. He is deeply in love with Estella, and these are his "Great Expectations." Of course, expectations don't always materialize, and the last third of the book chronicles his downfall. Miss Havisham is not his benefactor--instead, it is the convict from his youth. Magwitch has been transported to Australia, and has made himself wealthy. He has come back to England (in direct violation of his sentence) to see the gentleman he has bought and paid for with his new wealth. Pip is appalled, and feels honor bound to refuse any more money from the man. He further finds himself forced to smuggle the man out of England, lest he be caught and hanged. In the end, he comes to feel empathy and affection for the man, but Magwitch is caught, and his assets are confiscated to the crown. Pip returns home, thinking that he will marry a girl from the village, only to find that she has married his uncle. His love for Estella remains, although she has married a brute of a man, and Pip needs to pay off his debts and find a living for himself. In the end, he takes a job in the company he (anonymously) helped his roommate to buy into. Years pass, he leaves England for the company, and he finds himself finally able to be comfortable with his lot as a working genteel man. He meets with Estella, who has left her brute of a husband, and there is the hint of a happy ending. Of course, being that this is Dickens, there are far too many coincidences to be believable. Magwitch has a double, a criminal who has enough education and manners to make Magwitch the fall guy for his own schemes. This man, Compeyson, is also the groom who jilted Miss Havisham, who he only wooed to get access to her money. Magwitch turns out to be Estella's true father. There are more, but these suffice to make the point. 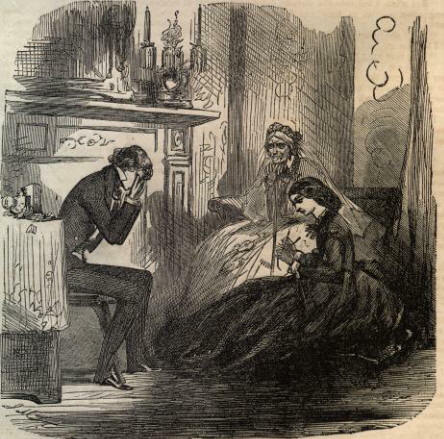 I haven't read much Dickens, but did recently read A Tale of Two Cities, and the writing is much better in Great Expectations. Sure, Tale of Two Cities has a killer opening sentence, as well as a killer last sentence, and how many books have that? "It was the best of times, it was the worst of times..." to "It is a far far better thing I do than I have ever done before." But inbetween, there is some of the sentimental claptrap ever committed to paper--and almost all of it uttered by his heroine, Lucy. The women of Great Expectations, in contrast, do not fall into this trap. Miss Havisham could have been a similar character, eternally mourning the wedding she did not have. Instead, she is a virago, a nemesis, turned bitter and angry and enacting a cold plan for revenge against all men. Despite living amid the ruins of her dreams (and I can only think that even that is better than marriage to Compeyson would ever have been), she looks on these relics in a way that just makes her hate grow stronger. Estella, too, is a cold and loveless woman--raised to be that way by Miss Havisham. She never varies from her charge to force men to fall in love with her, and then leave them. Even by the end of the book, after her disasterous marriage, she is not tender so much as she is bruised and regretful--hoping to find some better way of living and feeling, but not confident she can do it. Pip's sister, "Mrs. Joe" is a bitter and selfish woman, all vinegar and bile. The woman who taught him to read, and who ends up marrying Joe, is kind and warm and loving in an entirely practical way. Pip's uncle Joe is a decent man, happy in his station, determined to do good to others and to live his life ethically. He is one of the few likeable people in Pip's life. The other is Wemmick, a man with two personalities: one at work, and one at home. Pip himself is a cipher, and a rather obnoxious character. I found him not at all likeable, but given the precarious social position he has to live in his whole life, I found that unlikability to be realistic. Dickens is also quite funny in this book--funnier than I tend to think of him being. Wemmick has an old, deaf father that he lives with and cares for, and refers to him as "Aged Parent," or "The Aged P." There is something so affectionately flippant about this that reminds me of P.G. Wodehouse. Some of the descriptions have the tartness of Jane Austen as well. Take another glass of wine, and excuse my mentioning that society as a body does not expect one to be so strictly conscientious in emptying one's glass, as to turn it bottom upwards with the rim on one's nose. I was always treated as if I had insisted on being born, in opposition to the dictates of reason, religion, and morality, and against the dissuading arguments of my best friends. Who knew Dickens was so funny? I certainly didn't. Turgid, didactic, heavy on the Victorian morals and ethos--but not funny! Maybe I'd better go read Pickwick Papers, huh? Anyway, this book has it all--humorous writing, gothic horror (Miss Havisham), tart women characters, foundling orphans, escaped convicts, theft and murder and hangings. You know, between the moral lessons, Victorian literature is quite lurid!